The World Cinema Directory is an ambitious project set up by the UK publishing house, Intellect. It aims to publish print volumes on every national/regional film industry/culture over a period of 3 years. The innovative idea is that each volume will first appear as a FREE download for a limited period, after which the print version will be published and an online pdf will be purchasable by libraries. But more than that, each volume will actually be written by volunteer contributors. There will be an online database of entries that will eventually become a volume. The aim is not to replicate IMDB etc. but to target the academic market with contributors expected to conform to certain academic protocols. Intellect hope that this will be a contribution to increasing diversity in scholarly work. I guess you need to read all the blurb to make sense of this. I downloaded the first free Directory on Japanese Cinema and then promptly forgot about it because I was busy. I’ve just noticed that it is free no more, although I think a version on Scribd is still available. The print version can be purchased via Intellect. I thought I would now review the Japanese Directory but also urge you to download Volume 2 on American Independent Cinema (see the link at the head of this post). 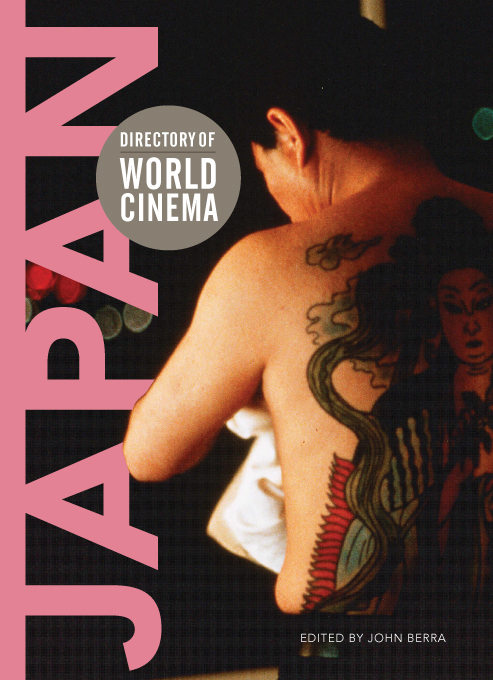 The Japanese Directory is 301 pages of material with an epic scope – sweeping across Japanese film history. It’s a massively ambitious undertaking and it looks very good in design terms. The structure offers essays on aspects of Japanese Cinema – specific directors, genres, time periods etc. followed by brief entries on selected films – synopsis, credits and critique over one or two pages in total. The contributors are a mix of younger film scholars and researchers and film journalists. The best-known name is probably Mark Schilling, who writes for The Japan Times and Variety, but all the others appear well-qualified to write about film. There is a contributor list and a detailed bibliography plus a list of useful weblinks and a quiz. Overall, this is clearly going to be useful, especially for students and film fans approaching Japanese Cinema for the first time. The breadth of material is a real attraction. But is this the right format – how does the balance between breadth and depth work out? What can you reasonably say in 400 words on a film like Tokyo Drifter (1966)? If you’ve just watched the film and want a quick view from somebody else and you found the 400 words here, you’d probably be very pleased. But if you’d bought the guide, you might feel that the analysis was restricted. Similarly, the essay on Yakuza films which precedes the analysis of Tokyo Drifter is around two and a half pages – perhaps 1500 words. My other main concern is about the quality of the writing and editing. Before starting this post, I read several articles and reviews in Intellect’s various film journals, most of which have at least one freely downloadable issue on offer. I came across a review of the Japanese/Korean entry in the Wallflower Press series of ‘24 Frames‘ – I reviewed the Middle Eastern and East European volumes some time ago (the books offer substantial essays on 24 significant films). The review was by the distinguished Japanese Cinema scholar David Desser and he savaged the book for its sloppy proofing and terrible indexing, especially in accuracy over names, film titles etc. So, I approached the Japanese Directory with trepidation. How accurate would it be? My knowledge of Japanese Cinema is not vast, but I know small segments reasonably well and I concentrated on those. On the whole, the Directory looks pretty reliable, but I did find errors, mainly in the editing. Just to pick out one, in the critique of Ozu’s Banshun (Late Spring) a well-known scene is described as taking place at a kabuki performance. Even the dialogue tells us that this was a noh play. OK, we’ve all made mistakes, but Desser has a point when he says that these kinds of books have to get the facts right. If there is a mistake in an entry on a film you know, it makes you wonder how accurate are the descriptions of the films that you don’t know. But I repeat that on the whole the Directory does seem reliable. A more serious charge is the lack of depth. Nothing is left out in terms of the types of films covered: dramas (old and new), New Wave and alternatives, anime and horror, monsters and yakuzas, blockbusters and chanbara (swordfight – samurai films) ‘pink films’ and auteur films are all present. There will be quibbles over the sections some films appear in (Desser will be outraged again that Realm of the Senses is described as a pink film) but at a basic level, anyone who comes to the Directory expecting to learn about Japanese Cinema will at least start with a clear sense of the terrain. This is the first Directory in the series and in some ways, it is like the first episode of a new TV series – there is a lot of ‘backstory’ and introducing of characters to get through. Presumably, future updates of this volume will be able to spend more time going into some of the issues that run across Japanese film industry and culture and less on making sure that readers know about key directors. The inevitable imbalances will then be ironed out. So, for instance, this volume touches on nearly every Kurosawa Akira film, but only one from Naruse Mikio and Masumura Yasuzo and two from Ichikawa Kon. The issues that need more coverage are the Japanese film industry (just the one here on the 1960s Art and Theatre Guild) and a much greater concentration on social and cultural context – either by increasing the number of essays or allowing writers more space on individual films. My conclusion is that if you want a clear, basic understanding of the breadth of Japanese Cinema, this Directory will be useful, especially if you are prepared to search for film titles on DVD and import some (US-based authors clearly have access to films not easily available in the UK). If your interest is specific and related to a handful of genres or auteurs, you may well be disappointed because although your hopes will be raised by sight of the entries, you might not learn as much as you would like. Will the Directory be helpful and motivating for students? Again, yes, I think so, initially, but they’ll then need to get stuck into the bibliography and weblinks. This entry was posted in Book Reviews, Japanese Cinema. Bookmark the permalink. Yes, even I had downloaded the free copy some time back and completely forgot about it. Sigh. Thank goodness, I’ve registered now. I’ll be downloading the American volume now.